I have my dream homeschool room. I seriously love it! It’s practically perfect. 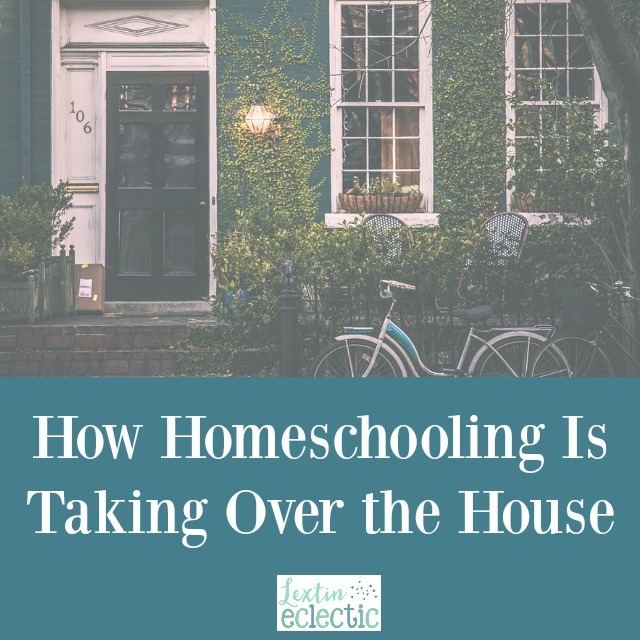 However, in the last two years, I’ve found that homeschooling is taking over my entire house. Homeschooling spills out into every room in my 3-story house. It’s making my little organized self a tiny bit crazy. On any given homeschool day, you can find my kids sprawled out on the couch reading. You’ll see an older child or two sitting in the upstairs office working away at the desk. Another child will be curled up in a recliner with a book, watching a DVD lesson. Yet another child might be upstairs on the top floor, enjoying the peace and quiet of a bedroom to complete an online lesson. And during all of this I’m usually down at the giant homeschool table, working one-on-one with one of my children while the baby sleeps nearby in a bassinet. Our homeschool did not look like this in the past. Usually most of the kids were in the homeschool room with me. Mostly because they required constant supervision and needed mom nearby to help with assignments and keep them focused. I am now experiencing a whole new world of homeschooling. Many of my kids can do some subjects independently. They don’t need me to hover over them while they work. Hooray! Let’s just stop and celebrate this fact. My kids enjoy the peace and quiet of other parts of the house so they can focus and complete their work by themselves. Then they haul all of the completed work upstairs to my desk so I can review it. This is huge! I have raised independent learners! This homeschooling thing is working really well! I just wish I had known how it would take over every inch of my house. Where we used to be able to just put down our homeschool books and shut the door, leaving the rest of the house a little less cluttered, now our homeschool is everywhere. There’s no escaping it! I’ve made it to a new stage of homeschooling and it’s a bit bittersweet as I reminisce on the old days of cramming around our table all together. I miss those loud and hectic homeschool days. So, I’ve instituted a short group school time where all my kids crowd around my chair as we read a few books together. It’s not quite the same, but it’s rewarding to be able to learn together, even just for a few minutes each day. I can’t believe I have “big” kids now. They no longer need me for every little thing. The sudden shift in our homeschool has taken me by surprise. I wasn’t expecting to feel so saddened by my kids’ independent learning endeavors. Yet I’m so proud of how they’ve grown and how they take ownership of their own education. Have you experienced any new stages in your homeschool lately?